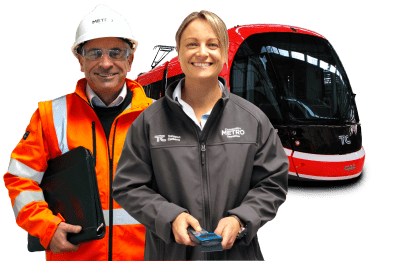 Canberra Metro Operations (CMET) is proud to be operating and maintaining Stage 1 Light Rail in Canberra. A talented group of individuals work in our company. We are passionate about fostering career pathways and providing diverse opportunities for employees. We are a close knit company all working hard for to achieve the same goals and daily commitment for our teams. All employees are respected, inspired and supported with the freedom to go the extra mile and proud to work for CMET. Comprising of 80+ staff, CMET employ staff from a variety of diverse backgrounds with vast experience. This includes operations, engineering, safety, ICT, customer experience, environmental and support staff.